We are part of a community of expressive arts therapists working in a hospital-based Activities Therapy Program, at Post-Acute Services, California Pacific Medical Center (CPMC) in San Francisco. During their stay at Post-Acute Services, patients have the opportunity to rest, recuperate, and receive a variety of therapies, including physical, occupational, speech, and expressive arts therapy. We provide individual and group services to a diverse patient population who are encountering a wide array of psychological and physical challenges (e.g. depression, anxiety, loss, trauma, sudden life-change, cancer, end-of-life, and long-term medical issues). We are united in a deep belief in the wisdom of the body, and the power of creative expression to foster psychological, physical and spiritual wellness. 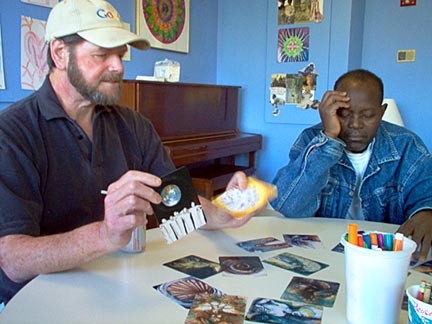 For several years now, SoulCards have been steady healing allies in our program. They are always close-at-hand and are integrated in a multitude of ways in individual therapy, group therapy and staff meetings. Most recently, we have begun introducing hospital staff in other department to the SoulCards, to encourage emotional expression, illuminate organizational dynamics, and promote creative problem solving. 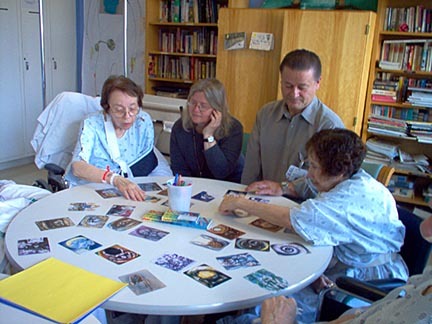 We have found that there are particular qualities of SoulCards, which make them highly accessible and effective in a hospital setting. The experience of hospitalization can be very stressful for many patients, and the deep emotions conveyed in the cards often accurately mirrors patients’ feelings. The images offer a bridge to more internal, unconscious processes, and during a time of great distress, can provide a feeling of increased clarity and stability. 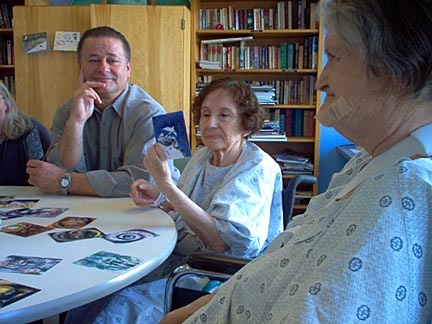 Additionally, as many of our patients have physical, verbal and/or cognitive challenges, the cards can assist in helping a patient express their experience, without the need to create a visual image, or in some cases, even speak. Often, an image will arise that stays with a patient throughout their hospitalization, and this image becomes a partner in the healing process, enlivening and nourishing the patient’s own healing imagery. One of my most memorable applications of the SoulCards in individual therapy arose with a gentleman, who arrived at Post-Acute Services for physical therapy and rehabilitation of a sprained ankle. Prior to his hospitalization, this patient was homeless, with a long history of obesity and drug abuse. In beginning our work together, it quickly became apparent that this patient had considerable internal resources, ready to be accessed, in helping him to become engaged in his life and to walk again. Our Expressive Art Therapy sessions ran parallel to his Physical Therapy Treatment, and our shared goals of building self-esteem, motivation, and insight, supported and energized his rehabilitation efforts. This patient was particularly responsive to a Cognitive-Behavioral approach and the cards came to represent specific actions or feelings that were named, and then together, we identified ways he could make the needed behavioral changes toward healing and wellness. In the assessment phase, the cards were helpful in letting me know how comfortable the patient felt in the symbolic world, and additionally, his ability to work with themes and metaphors. Initially, we worked with the cards facing up, to assist him in concretizing and clarifying his goals. The patient picked three cards and immediately proceeded to tell me about each aspect of his life that it represented: the past, the present, and the future. 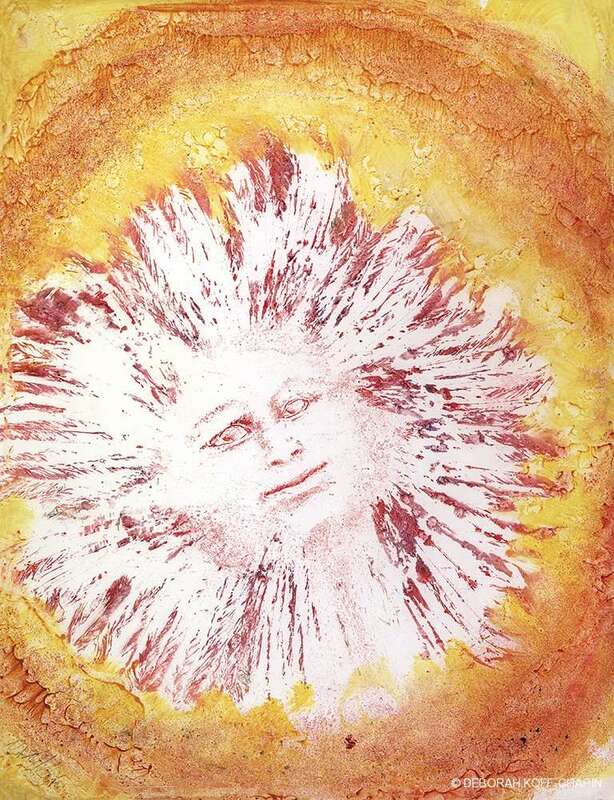 The card for his present was of an image of a sun. He elaborated that this image represented for him, that he was ready to step into his “bigness” as he named it, and begin to take responsibility for his life again. This card also represented his desire to walk. With this image, I could then explore and elaborate with him what the bigness looked like in relationship to his walking. This image began to serve as a strong motivator in his Physical Therapy process. 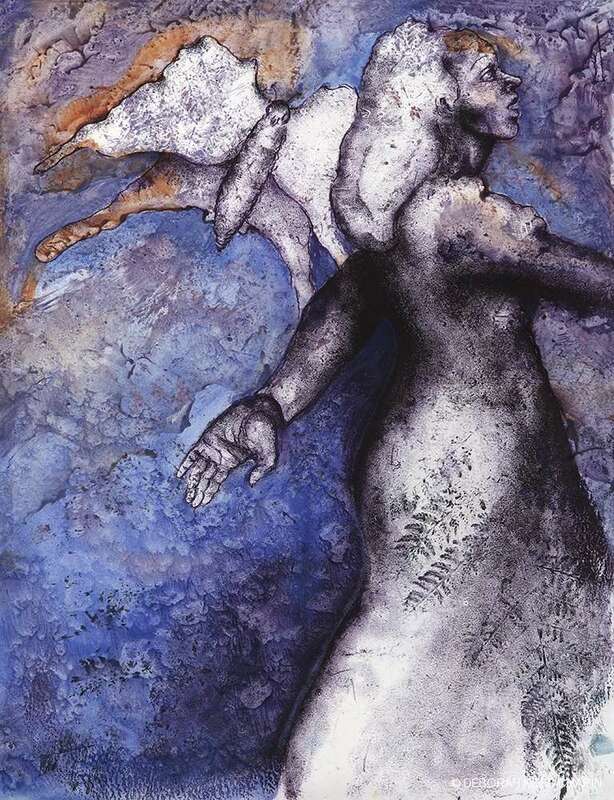 Throughout the three months of his hospitalization, we returned often to the SoulCards to assist in identifying where he was in his process, and every time, the images revealed deeper layers of meaning. 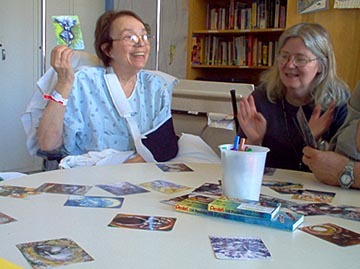 The SoulCard process was utilized in conjunction with verbal therapy and other expressive mediums, which assisted in further exploring the material that arose for this patient. The cards offered an effective way to access emotional and personal material in this patient’s life in a safe and timely way, as the images evoked would often take us to the heart of the matter, essential in a short-term therapy process. Finally, during our closure meeting, I brought the SoulCards in one last time. This time, the cards were offered face down, as the patient indicated his readiness to be guided solely by his intuition. The last card he chose, he titled “A blessing that the work has paid off”. The card was an image of a woman walking away with a butterfly on her shoulder. He shared that this image represented his own achievement of walking, as well as symbolizing his experience of transformation in therapy; he now had an ally, and he had internalized this ally, by befriending parts of himself again. The SoulCards assisted this patient in finding an imaginal language for making significant changes that were essential in his rehabilitation and preparation for returning to his life outside the hospital. In patient groups, we often use SoulCards as a means to explore group members’ current experience, such as emotional and physical pain, anxiety, sadness, and depression. The group composition may vary widely from day to day, with patients often arriving late. However, the images are so evocative, that even in the event that a patient arrives late to group, he or she can easily and almost immediately become engaged. The flexibility of the cards offers endless possibilities for groups, such as utilizing the images as a springboard for conversation, storytelling, movement and visualization. We have found that it is important in group settings to model the initial step of just describing and exploring the image, prior to any interpretation. This assists in a much fuller exploration of how the images might inform an individual and/or group process. Most recently, I used the cards in a Creative Expression group. I had the cards spread out on the table, face up, and led the group in a brief meditation, asking them to reflect inwardly, and to notice how their bodies were feeling that day and how they were feeling emotionally. Then, I asked the group members to open their eyes and chose a card or cards to express what they had discovered. Once everyone had chosen his or her card(s), everyone was invited to share. The idea was to give each patient a way to express, concretize, and if needed, to provide some distance from the pain or complex emotions he or she was feeling. Once this was done, I asked the group then to take another brief moment and reflect inwardly to explore how they’d LIKE to feel, and then choose a card or cards to represent these feelings. Here, the idea was to give the patients an image to take with them mentally to use as a visualization tool, as well as to end the group on a positive note. I described ways to work with the image visually through silent contemplation and allowing the image to come alive. Everyone again shared and the group did end on a particularly upbeat note, with the group spontaneously bursting into song and holding hands in a circle as a closure. 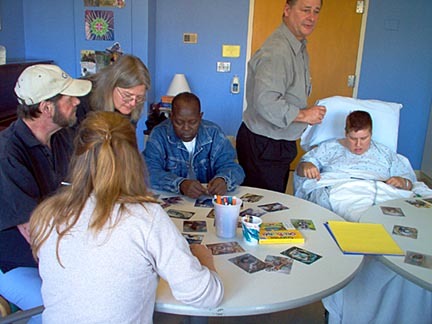 SoulCards can also be used as a means to connect with the hospital staff, whom often are too busy to even have time to reflect on the complex emotions they experience on a daily basis. In one such case, I integrated the SoulCards in a discussion with a staff member, who was particularly distressed over a very needy and demanding patient. The images assisted her in clarifying her feelings toward the patient and her experience of how other staff members were or were not helping her. 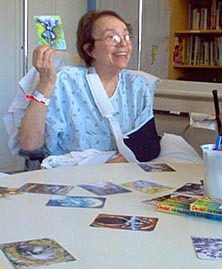 The cards helped get her out of her head and into her heart and to how she was actually experiencing her situation. This gave her a better way to express the problem at hand and a way to see what things could effectively be done to help her situation. In a broader way, we have been identifying ways to introduce the SoulCards to the larger community in the hospital. The cards have elicited a lot of comments from nurses when I have had them with me at the nurses’ station on the way to a patient’s room. This gave us the idea (still in the works) to put a set on a wire at each of the nurses’ stations with a small sign, inviting the staff, patients, and visitors to explore the cards as a means to identify their feelings, gain insight, or find some inspiration. I also plan to use the SoulCards as a means to start our next staff discussion around creating positive change on the unit and improving patient satisfaction. I will suggest that each person choose a card that reflects how they see the unit now, and if they wish to change it, to choose a card that symbolizes their intention of how they would like things to be. By doing this, this process will assist the conversation to ensue from a creative mind from the outset, allowing for easier, more imaginative and innovative problem solving for the deepest benefit of all, patients and staff together. We have been enjoying the process of bringing to manifestation the multiple of ways the SoulCards have been integrated into our setting. They are truly part of our team! For more information on our program and/or the integration of SoulCards in a hospital setting, please contact our office at (415-750-6800 x 21548).